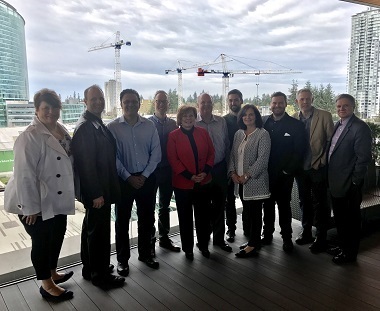 Representatives from 11 churches briefed Surrey Mayor Linda Hepner last month on how they are serving the city. From left: Brenda-Lee Sasaki (Surrey Alliance), Michael Vuorensivu (Cedar Grove), Steve Bains (Gracepoint), Ryan DelBlanc (Peoples), Mayor Linda Hepner, Dean Cooper (Peace Portal), Jon Thiessen (Johnston Heights), Loretta Hibbs (Dream Centre/Relate), Chris de Monyé (Village), Jim Heuving (Pacific Community) and Peter Klenner (All Saints). Craig Millar (Horizon) is missing from picture. What began as a coffee discussion between two pastors – Dean Cooper of Peace Portal Alliance Church and Steve Bains of Gracepoint Community Church – has become much more. Over time, other pastors joined with Cooper and Bains and a dream began to develop – that churches all over the city would serve the community as one body of Christ. The result was a breakfast meeting with Surrey Mayor Linda Hepner just over a year ago. Five churches were represented at that meeting. ‘The church’ wasn’t there to ask the mayor for anything, but instead asked how they could partner with the city. Hepner shared her main concerns and the meeting ended with the pastors promising to grow the church’s involvement all over the city and to meet the needs presented by the mayor. Over a period of 18 months, the group has grown from five to 11 churches (Surrey Alliance, Cedar Grove, Gracepoint, Peoples, Peace Portal, Johnston Heights, Relate, Village, Pacific Community, All Saints and Horizon), with several others showing serious interest. In April of this year, the mayor invited a delegation back for a breakfast meeting to report on progress. The 11 churches each provided a report to the mayor on the ways they are serving the city. Mayor Hepner was quite taken aback by how much the church is serving together and responding to the needs of the city. In each of the areas above, many churches either partnered together in the venture or supported it financially or with volunteers, or both. Rarely is only one church involved unless it is a specific need, for example, Chinese ESL in one area and Syrian ESL in another. The Dream Center is a volunteer-driven organization that finds and fills the needs of over 40,000 individuals and families through approximately 70,000 encounters each month, with many accessing multiple services. We do this through mobile hunger relief and medical programs, residential rehabilitation programs, a shelter for victims of human trafficking, transitional housing for homeless families, foster care intervention programs, job skills training, life skills, counseling, basic education, Bible studies and more. . . .
Cooper and Bains feel that working together in this way is significant because it allows church and denominational barriers to come down while the church service quotient goes up. There is a big administrative function in all this, they point out, but they believe it is worth the effort. Thanks, Flyn, for bringing this forward. It’s a great initiative and I am personally acquainted with both Dean and Steve. Sounds more than just exciting. It’s a demonstration of the value of the church in the community and an example of how much Christians, as well as other faith communities, are contributing to public life. And. of course, it’s an outworking of what Jesus taught us to do.